Adapted from instructions by Lisa Gentry, published in Leisure Arts #75358, Crochet Celebrity Slouchy Beanies for the Family. I like the roll brim look. 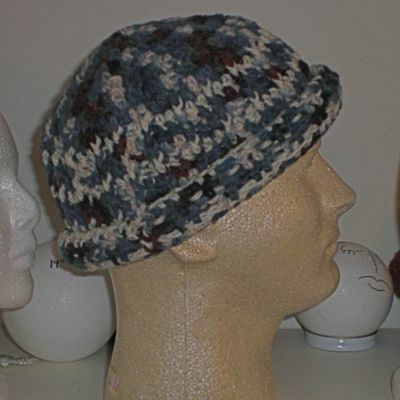 You can also unroll the brim and wear it like a, well, slouchy beanie hat. Suffolk & Dorset Solitude Wool (70% Wool, 30% Nylon). 3.5 oz / 99 g. 240 yds. Color: Handpainted Blue. Suffolk & Dorset Solitude Wool (70% Wool, 30% Nylon). 1.7 oz / 48 g. 120 yds. Color: Speckled White.